I cannot believe that we are already in the month of December. It is the time of the year I go on a baking and shopping spree. This year I am trying to cut down the shopping. I already baked my Kerala Plum cake and its sitting in the dark to mature the flavors. Meantime I thought to make something traditional to kick start my December post. I wouldn't be exaggerating if I say that I love my Mom's 'Aval Vilayichathu' the best out of what I had so far. Of course anyone would feel the same about this Mom's food, right? But I can assure you that you will fall in love with this 'Aval Vilayichathu' if you try it your own. Traditionally it’s served with small type of Indian banana ('Poovan' pazhum). Since it’s not readily available where I live, I enjoy them with the regular banana. Each time I visit my parents, my Mom makes a batch as my hubby is an ardent fan of 'Aval Vilayichathu'. And I have a confession to make to my readers that I was so spoiled by Mom by getting bags of this snack each time that I never tried making it my own. Since my parents are on vacation trip to India, I had no choice other than making it by myself. I had asked my Mom for this recipe several times and I never bothered to jot it down each time she explained it to me as I knew that she will make it for me. But I had to call my Mom to get the recipe and my Mom was like 'Really you don't know this!! I had given you this recipe 100 times'.....hehe....that me. There are lots of traditional snacks she used to make when we were young and I haven't even tried at least 10% of what she knows. Let’s come back to 'Aval Vilayichathu'. It’s simple and nothing tricky. It takes only 30 minutes to prepare this delicious snack/dessert. All you need is to get the right ingredients from your Indian grocery store and you are all set. Make sure to pick the darkest jaggery blocks/balls you can get. It gives the nice traditional dark color to the 'Aval'. You can very well adjust the types of nuts you add to the 'Aval'. Traditionally you don't add Vanilla and raisins, but my Mom adds that and it gives a nice flavor and chewy bite to the 'Aval'. Also make sure to use the brown rice (Matta) flakes as it tastes better than the regular rice flakes. Thin Poha will not work for this recipe. You have to use the Kerala style beaten rice for this recipe. You can find it in any Indian store that carries Kerala grocery. Hope you will try this recipe during this Christmas time. 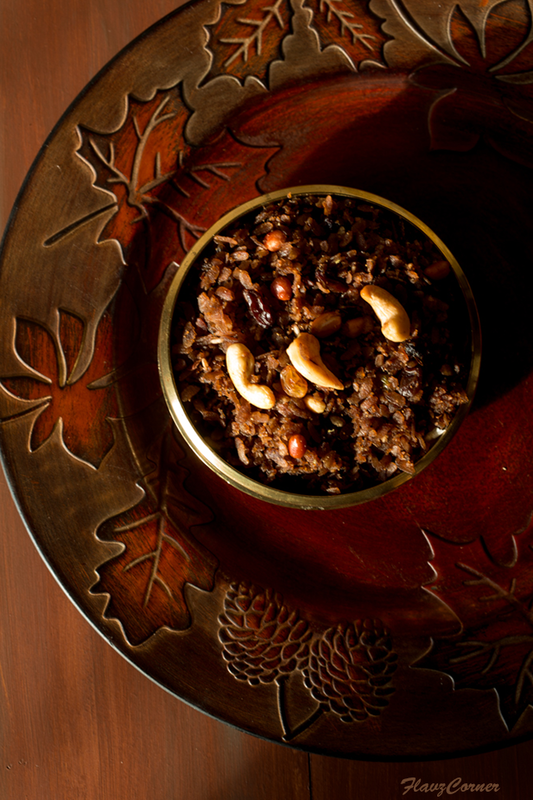 Melt the grated jaggery in 3/4 cup of water in a sauce pan over medium heat. Turn off the flame and strain the liquid to remove any impurities. The jaggery syrup should be boiled just enough to melt the grated jaggery during this step. Powder the ingredients under the 'To Flavor' list using a pestle & mortar or in a coffee grinder and keep it aside. Melt 3 tbsp of ghee in a non stick pan and roast the cashews first. Remove them and roast the peanuts, coconut pieces and finally the raisins. Turn off the flame and keep the roasted items aside. Check the beaten rice flakes for any rice husk and remove them. Take a heavy bottom non-stick pan or 'Urili' ( the authentic Copper pan) and add the strained jaggery syrup. Turn on the flame and let it come to boil. Add the grated coconut and 2 tbsp of butter and mix well. Let it cook till the syrup gets half its quantity. When tested the syrup should be little sticky when pressed between your fingers. Turn off the flame and add vanilla extract and mix well. Now add the cleaned rice flakes in batches and keep stirring till the coconut jaggery syrup is completely soaked by the rice flakes. 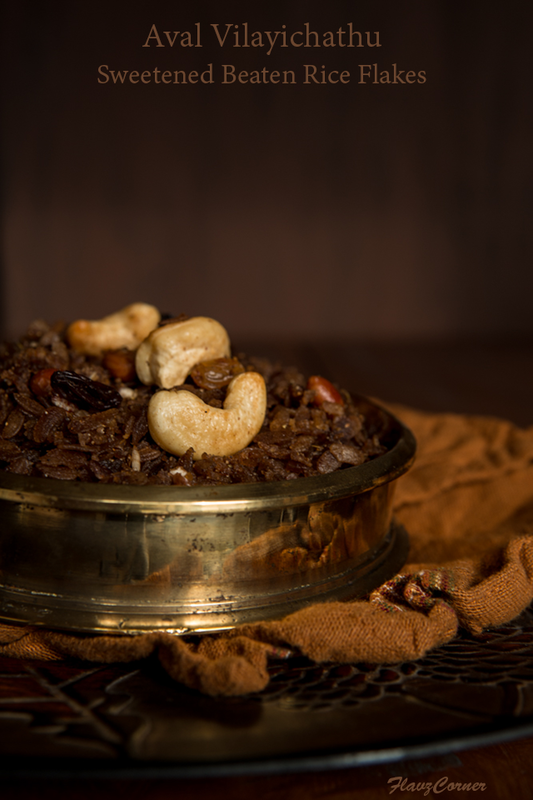 Add the powdered ginger, cardamom and cumin followed by the roasted nuts, coconut and raisins and mix the 'Aval' well. Let it cool down and absorb all the flavors and moisture for at least 4 to 8 hrs in the same pan. Enjoy them the next day with banana. The left over can be stored in the air tight container for a week outside or in the refrigerator for 2 weeks. 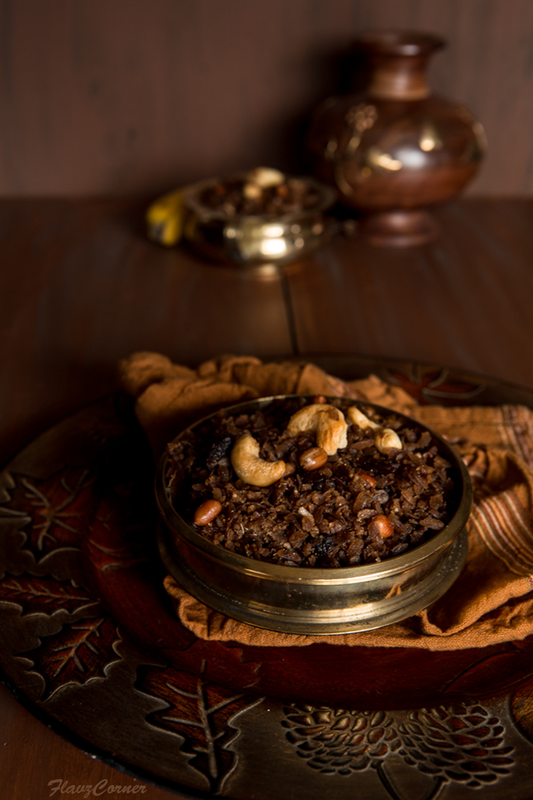 The best way to enjoy the Aval Vilayichathu is by warming it up in the microwave for 30 seconds and mix with banana. One of my favourite traditional snacks! Umma also asks me the same questions - ethra pravashyam paranju thannu, eppozhum ariyille? Hehe... The aval vilayichathu looks so delicious... Yes, with a pazham, it is fantastic! I had to come by to see this recipe because I love sweet aval any way. I have never tasted or tried this Shibi. Looks so amazing. I was reading the recipe, it almost feels like candied aval. It must taste divine, yum. I'm making this sometime. I'll tell you how it turns out. That was so sweet of you Asha. Let me know how it turns out for you. It looks so flavoursome and delicious. Will it work with oat flakes? I never tried this with Oats, but I don't see why it cannot be experimented. You may have to toast the oats a bit though. Let me know how it turns out. ohh Shibi...kothipichille....its my favorite among all the snacks....And what superb photography...kudos...nannayitunde keto...and the aval velayichathu has come out so perfect ...that authentic colour.. I've not had this before -- sounds so interesting! Really fun recipe, and I love the light in the photos. Great post -- thanks.